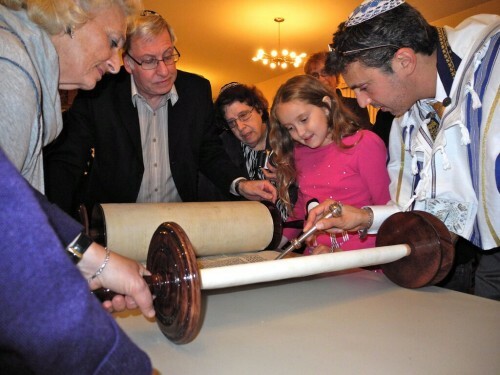 Membership at Temple Beth-El reflects our open approach to building spiritual community. Our annual dues are among the lowest in the Jewish world – ranging from $550 to $1000 for families and $275 to $500 for singles. The reason our dues are so low is simple: we want to welcome everyone, regardless of means, to make a vibrant spiritual home with us. This approach allows us to welcome seasonal members, persons who also affiliate with another community, and non-Jews wishing to associate, learn, celebrate and pray with us. While all of our services are free and open to the public without tickets or reservations, membership provides access to free classes and programs, low-cost lifecycle events, spiritual direction and other rabbinic support. Membership also is a terrific way to be involved in a hands-on community that welcomes active participation and invites interested persons to enter into community leadership. Under an exciting and innovative partnership begun in 2014, TBE members also become eligible to participate in the religious school of Sinai Free Synagogue of Mount Vernon. More information about this innovative partnership is available on our religious school page. Persons wishing to become TBE members are invited to contact our Membership Chair, Elaine Belasco. For payment plans or dues remission, contact Paul Klein (1-718-885-3090) or Elaine Belasco. Prefer pen and paper? Become a member by filling out and mailing a paper application (click to download the application). With our sliding scale of dues please choose the highest amount you can afford. If you have been given financial assistance for paying dues by the Shul please use this membership dues form. Please make the check out to Temple Beth-El of City Island and mail your check to P.O. Box 188 City Island, NY 10464 within 3 business days. Care to help out Temple Beth-El in other ways? Select all that you would like to do. Tell us what else you can do to help the shul.